But MPs will again vote on alternatives on Monday, a customs union with the EU thought to be MPs' most likely preferred option. Although European leaders agreed to the plan, Mrs May has yet to get the deal approved in Parliament. The prime minister has until 12 April to seek a longer extension to the Article 50 process to avoid the UK leaving without a deal. What deal did MPs reject? 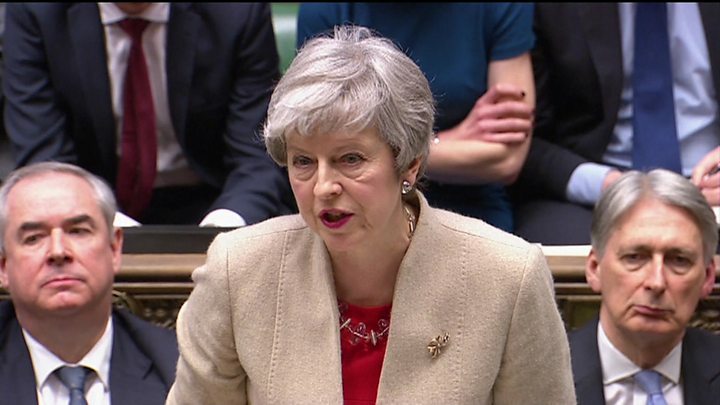 Mrs May said the UK would need an "alternative way forward" after her plan was defeated by a majority of 58 on Friday, following earlier defeats by 230 and 149 votes. BBC political correspondent Alex Forsyth described the cabinet as "deeply divided" over what to do next. She also accused the prime minister of being "out of control", saying: "Theresa May is stamping her feet and saying I want this, no one else is allowed to do anything else." It "looks like the time may come" for another attempted no confidence vote in the government, she added. The deputy chairman of the Conservative Party James Cleverly told Sky News that his party is doing "sensible pragmatic planning" in case there is a snap general election, but not seeking preparing to call one. And speaking to the Andrew Marr show, Justice Secretary David Gauke said he did not see how a general election would solve the current deadlock. He added that if MPs are voting in favour of a softer Brexit it would not be "sustainable" for the government to ignore Parliament. He said the Conservative Party could split if the prime minister pursued a customs union with the EU as "it would amount to a reversal of the referendum result". However, he also wrote that on Thursday evening he had decided to support the withdrawal agreement before being talked out of it. A customs union is one of the options which could be considered by MPs from all parties during a second round of "indicative votes" on Monday. MPs are to vote on a series of options designed to test the will of Parliament to see what, if anything, commands a majority. None of MPs' eight proposed options secured a majority in the first set of indicative votes on 27 March, but those which received the most votes were a customs union with the EU and a referendum on any deal. 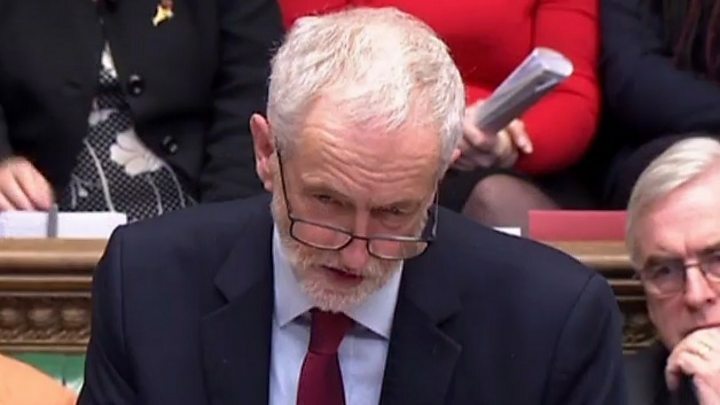 Labour leader Jeremy Corbyn supports a customs union, to protect the issue of avoiding a hard border in Northern Ireland. Meanwhile, a number of senior MPs tipped as future Tory leaders have articles and interviews in the Sunday papers setting out their policies. Dominic Raab, who quit the cabinet in protest at Mrs May's handling of Brexit, explained how he would tackle knife crime in the Sunday Telegraph. Chief Secretary to the Treasury, Liz Truss, called for the Tories to "modernise" in a wide-ranging interview in the Sunday Times. She highlighted cutting stamp duty for young homebuyers and business tax as key policies. In an interview with The Sunday Times, the Remain campaigner said the party needed a leader for the "2020s, not the 1920s". That is why the government separated the withdrawal agreement from the political declaration - on the future relationship with the EU - for Friday's vote. The withdrawal agreement is the part of the Brexit deal Mrs May struck with Brussels which sets out how much money the UK must pay to the EU as a settlement, details of the transition period and the so-called Irish backstop arrangements. Her comments led to speculation the PM could try to call a general election. But Foreign Office minister Sir Alan Duncan told The Observer: "If we have a general election before Brexit is resolved, it will only make things worse."